Life as a leader serving in the military is many things and it most definitely is a life of continual change. Truth is that it is this continual change that makes it so enjoyable. The opportunities we create change, the problems we get to solve are new at every turn and the individuals who make up our team come and go on a regular basis. When the team is made up entirely of uniformed personnel, the change is so continuous and such a big part of who we are that though we pay careful attention, the changes concern us little. When the team enjoys long-term civilian continuity, it’s a little different. I am the 6th Commanding Officer at Navy Cyber Defense Operations Command and am blessed to serve with an amazing team of military, government civilians, and contractors. They are a very observant team and many of the civilians have been a part of the Command for a long time. They see a new Commanding Officer at the helm every two years and though each one of us has been different, evidently the cycle has been the same. A few months back, one of the teammates I value most presented me with what he calls ‘The Commanding Officer Curve’. He tells me that though the speed at which the curve is executed varies, the stages do not. 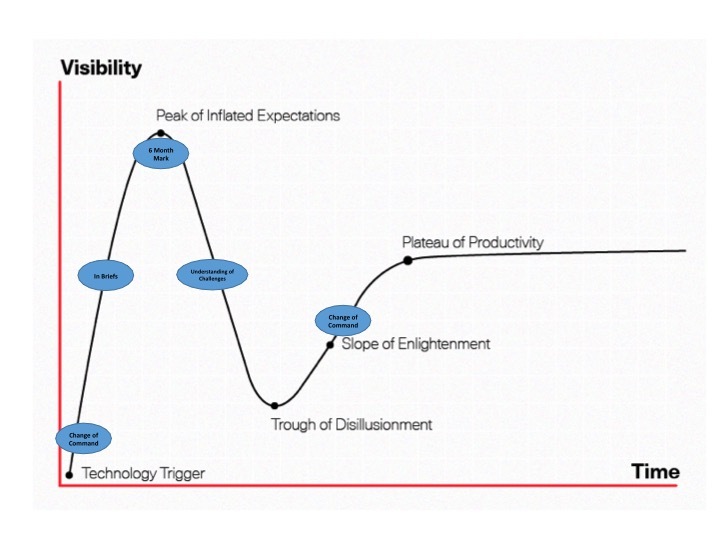 The graph will be very familiar to those of you familiar with the Hype Cycle. All Commanding Officers show up energized and ready to contribute, yet relatively blind to the challenges and opportunities presented to the Command. As we immerse ourselves in the mission and learn from, with, and about the teammates with whom we serve, the increased visibility drives us toward the ‘Peak of Inflated Expectations’. We begin to see all that is possible and question why what we are beginning to see isn’t already the reality. As the opportunities we see become more obfuscated by challenges, we fall into the ‘Trough of Disillusionment’, frustrated by the things we try to influence well outside of our control, as well as the pace of progress on the priorities we set internal to the team. Just as we find the trough, we begin to see that through the application of our growing wisdom we are making progress. About the same time, we see our rotation date closing in on us and the sense of urgency picks up. And just as we look to be finding our stride, we leave and our relief enters the picture only to ride the very same curve. I have been in Command for one year (370 days as of this post) and as I look back the curve most definitely applies to me. I’d like to think that my highs weren’t as high and my lows not as low, but there most certainly has been variance. What I know for sure is that I remain ahead of the curve, as though I have most definitely experienced the ‘Trough of Disillusionment’ it is in my rearview mirror and I have long ago commenced the climb that is the ‘Slope of Enlightenment’. I’ll leave it to others to assess whether or not I am on the ‘Plateau of Productivity’. Regardless, I most certainly am committed to finding that plateau long before change of command. I believe there is goodness in the ‘Commanding Officer Curve’ and that it represents a healthy evolution of mindset. The key is to reach the ‘Slope of Enlightenment’ as soon as possible. But, it’s important to realize that you must reach the peak and endure the trough before you can start that climb to the plateau. Truth is, this curve applies to far more than a Commanding Officer. It applies to any nomadic professional. It’s a curve that represents personal growth for the individual and if not executed effectively represents a potential point of frustration for those on the team who provide the necessary continuity. For no matter where the leader is on this curve, the true objective is to keep the team progressing along the ‘Plateau of Productivity’ and not the ‘Whirlwind of Busyness’. How might you minimize the trough? How long does it take you to reach the plateau? I’d love to see where the “Whirlwind of Busyness” fits in this graphic. Maybe it would be a descending dotted line from the Plateau of Productivity to indicate an alternate reality (which might indicate an organization that has lost focus). Or maybe it’s something more awful: a dotted line from the Trough of Disillusionment. Great thought! I could go with either of your ideas. I do know that it’s not a happy place and I do my best to get out of it as soon as it begins to swoop me up.